Assault tank conceived for breakthrough attacks on enemy fortifications. The design project was ready on October 5, 1943. No prototypes were built. However, the project became the basis for the A39 Tortoise heavy assault tank. The AT 15a is an incredible TD. It has great armour, an accurate, fast firing gun and it is more nimble than it looks. However it is slow and prone to loader deaths due to its 152mm weak spot on the roof. Excellent frontal armour, will bounce shots from tier 8 tanks. 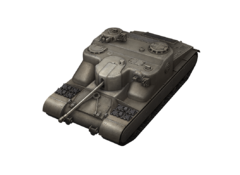 Good side armour, can bounce shots from tier 5 tanks. Wide gun arc and high gun depression. Slow and large, making it vulnerable to flanking. Machine gun turret is a large weak spot and hits will often kill the gunner. Slits behind gun mantlet is a large weakness, allowing tanks to penetrate the front. The AT15a comes elite in its stock configuration. This page was last modified on 25 March 2016, at 10:20.